Postville Blacksmith Shop has won the Gold Award for gates and railings from the National Ornamental & MiscellaneousMetals Association (NOMMA) twice, one for restoration work the other for gates at the International Crane Foundation. Partner Robert Bergman has been a demonstrator at many NOMMA conventions and has been profiled in The Fabricator Magazine, Vol.39, no.6. Mr. Bergman has been featured in the Artist Blacksmith Association of North America journal- The Anvils Ring- several times. Vol.14, no.1 contains a story of a craftsman's journey through England and Scotland. Vol. 30, no.2 has a recent profile. He was a director of the association from 1997- 2000. The ABANA Journeyman program was established during this time. It has encouraged young craftsmen to travel internationally for learning and friendship. Anvil magazine published a photo story of a demonstration of forging a human figure, which was done at the 1998 ABANA conference. 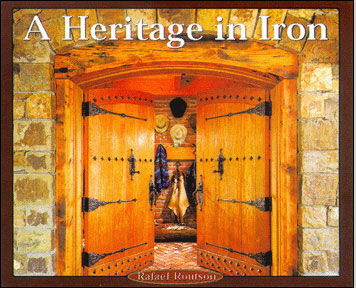 A Heritage in Iron, by Rafael Routson, tells the story of the preservation and history of two ranches in southern Colorado. The book features a variety of ironwork that was forged by Postville Blacksmiths. Several Postville Blacksmith jobs are featured in The Contemporary Blacksmith, by Dona Meilach.